On Monday, we were on the move again and it was also a national holiday. Monday was Africa Day, though in Ghana it is referred to as African Union Day. It commemorates the founding of the Organization for African Unity, what is now the African Union, in 1963. Ghana is one of only six countries that recognize it as a national holiday. If you search African Day 2015 on Google, the top result is from Ireland, which is strange. I am linking to the African Union chairperson's letter here. As we started out that morning, our guide Nii Kpa Kpo, spoke a great deal about his dream for African Union. Below is a compilation of several of the things he had to say. *Once again, ignore the fact that the SoundCloud embed has my Facebook profile picture. As soon as I get a good picture of Nii, I will replace that. When you don't upload a picture with the clip, they just use the profile picture automatically. We did not head straight back to Accra on Monday. 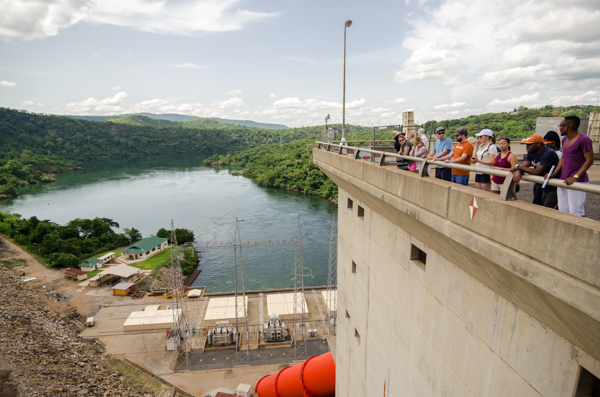 We took a small detour to the Akosombo Dam. The flooding of the Volta River Basin to build the dam displaced about 80,000 people (who were relocated) and created Lake Volta, the largest man-made lake in the world (by surface area). It was built with support from US investment to provide power for the aluminum industry and was completed in 1965. When it was first online, it was able to provide power for Ghana and several other countries (I cannot remember if it is three or five). *Lake Volta is not in this picture, that is the downstream end of the dam. 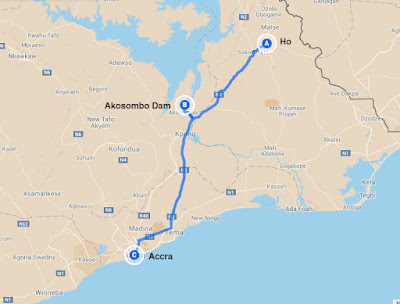 That is just the Volta River. Today, things are quite different. Thanks to an unusually long drought (that I am sure has nothing to do with climate change since that isn't a real thing) Lake Volta is at an unprecedented low level (below the minimum level for the dam to operate at full capacity). Only four of the six turbines were in use on the day we visited. 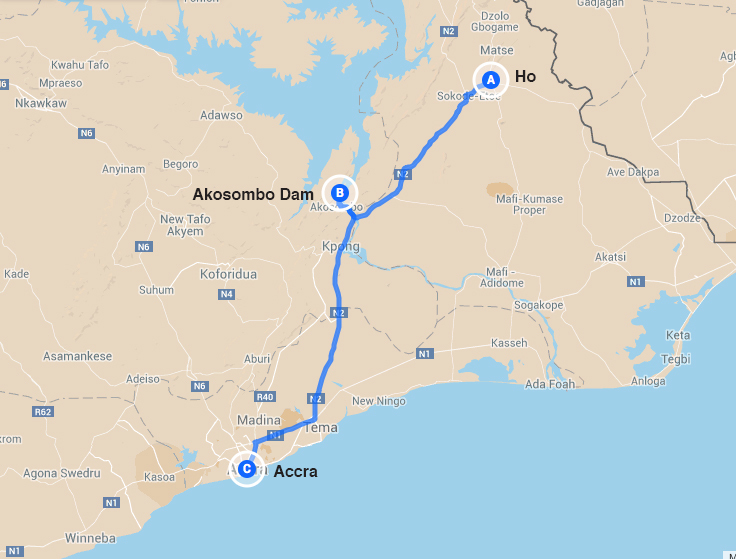 The lack of hydro power is one of the more recent causes of the frequent power outages in Ghana, referred to as dumsor. Dumsor (or more appropriately dum sɔ) is a popular Ghanaian term used to describe persistent, irregular and unpredictable electric power outages. The term is derived from two separate words from the Asante Twi, the Akuapem Twi or Fante dialects of the Akan language (a language spoken widely in Ghana), dum (to turn off or quench) and sɔ (to turn on or to make light), so the term roughly translates as "on-and-off". The frequent Ghanaian blackouts are caused by a power supply shortage. Ghanaian generating capacity is currently 400-600 megawatts less than Ghana needs. Ghanaian electricity distributors regularly shed load with rolling blackouts. At the beginning of 2015, the dumsor schedule went from 24 hours with light and 12 without to 12 hours with light and 24 without. The long blackouts contrast with the practice in other countries, where blackouts roll rapidly so that no residential area is without power for more than one hour at a time. Interestingly enough, as a tourist the dumsor has not affected me (so far). Power went out briefly on two occasions at our hotels, we had a site visit at the West African AIDs Foundation (details TK) and they were operating on a generator, and the power briefly went out at a clinic where I had taken a student (when I say briefly, I mean almost flickers). * Other than that, I would have no idea there was a power problem. Clearly based on the news though, your average Ghanaian is well aware. *As I type this, we briefly lost power at the hotel. 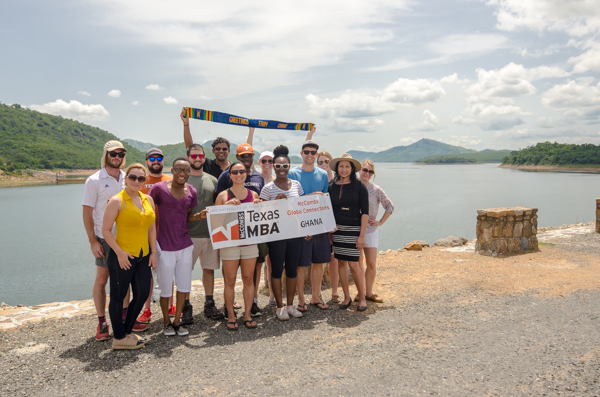 *This is Lake Volta behind us. Once we were back in Accra, the students continued on to the Kwame Nkrumah Mausoleum, National Museum, Independence Square, and a crafts market (I think this is the crafts market, I am not sure). I however, did not join them. I had a student with what was clearly a case of food poisoning that started Sunday night. The long bus ride to town was not her favorite thing and I accompanied her back to the hotel once we were in Accra. Though I am sad I missed some pretty interesting sites (including a man in the market named Colin Powell who knew all the countries and states and their capitals), I was a little thankful that I had the chance to spend some time quietly in my room. Since I cannot share with you about those sites, I will share with you another clip from Nii Kpa Kpo on the Ga people.